So here it is: our final bracket projection before The Selection Show in just a few minutes. Connecticut has secured the automatic berth from the American Athletic, avoiding some more last minute drama as they knock off Memphis, whose would-be automatic berth would have knocked out one more bubble team. UConn, as you may recall, knocked off top-seeded Temple in the AAC tournament yesterday, which now puts the Owls very much on the bubble. Still, I think they’re in. And as it is, the field is set, which makes this our best guess as to which 68 teams make the field. And the first (and perhaps best) debate is San Diego State. The difference between them (the first team out in this projection) and Tulsa (the last team in in this projection) is at the same time both razor thin and incomparable. San Diego State has the far better RPI, but Tulsa has many more quality wins. It’s really comparing apples and oranges. Ultimately, though, the decider here is San Diego State’s horrific loss against San Diego. San Diego’s RPI is 302. Just to compare, any loss to a team with an RPI of 175 or worse is generally considered a bad loss and certainly anything worse than 200. So 302? That’s awful. San Diego State could’ve avoided any debates by winning the Mountain West to secure an automatic berth, but instead it will be the Bulldogs of Fresno State who go dancing. So Tulsa is in, at least, according to us. In, but hanging by a thread. In fact, they’ve been leap frogged by Michigan, whose upset of Indiana was a big enough statement to slide them into the tournament. The win improved their RPI slightly – which still isn’t great – but adding another win against a Top 20 team is the kind of thing the selection committee will love. The Wolverines will probably have to play their way into the first round, but at least they’ll have a shot. The upsets in the high-major conference tournaments has also given us a reshuffling of the top seeds. 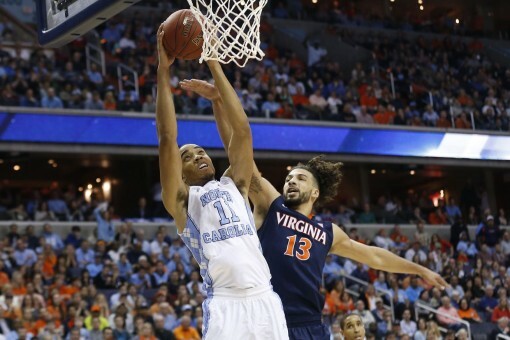 North Carolina wins the ACC, an honor that likely will make them the second overall #1 seed. Villanova, on the other hand, lost the Big East tournament to unlikely champion Seton Hall, which likely costs them a spot on the top line in a region. Replacing them is Michigan State, who held off Purdue just a little while ago to win the Big Ten. Taking advantage of the shifting top seeds is Oregon, who moves from the fourth overall #1 seed to the third overall after handily dismissing Utah to win the Pac 12. 10 St. Bonaventure 10 Wichita St.